Team Scary Potter and the Hauntwarts Express reviewed this attraction on October 14, 2017. 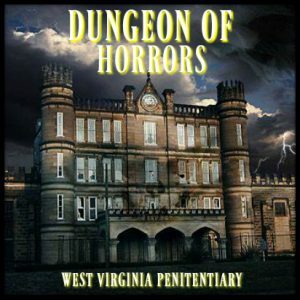 Completely overhauled and redesigned for this season, Moundsville, West Virginia’s Dungeon Of Horrors offers a new vision of horror this season. Taking a cue from Dante’s Inferno, the Dungeon invites you on to experience the final moments of an ill-begotten life, the horrors of death, and a journey into the Underworld to meet the Lord of Darkness himself… all in the name of good fun, right? Right? This season’s Dungeon absolutely should not be missed. The guards in the prison section were all excellent. Despite the intensity of the experience, we didn’t see a single cracked smile or wavered character. Necessary as it was for them to be, well, guards (and thus pretty intensely mean) as part of their portrayals, no one ever crossed over into cruelty or “going too far.” It was a very thin line to walk – to be believable but not overwhelming, but we felt that they trod it well. The female guard who sorted us into cells gave the stand-out performance, even inserting a few impromptu heckles into her dialogue for good measure. These realistic performances were a large contributor to the incredible degree of realistic dread that was generated by the first segment of the attraction. After shifting into the more “fantastical” portion of the haunt, the characters eased up a bit (which is not saying much, believe me), with one of the first folk that we encountered, a gentleman who helped me out of my coffin, shouting at me “God, your hair-do is frightening!” Yeah, I get that a lot, Beelzebub. I couldn’t help but laugh at that one. A young, baby-stealing demon barked out her displeasure in a foreign language, while simultaneously turning her nose up at us. Ouch; I didn’t want to be your sacrifice, anyway! See if I care…sob. Additional noteworthy performances belonged to the Queen, who was about as intense as one might expect from the apparent monarch of the Underworld, a “shushy” gal in the “sheet maze” who lead us away from an unseen sleeping monster, before suddenly disappearing without a trace, the kind soul (one of the few) who provided us gold to cross the river, and the Stygian swamp creature who quietly swam toward our boat. A third of the haunt is populated solely by guards and realistic representatives of the enforcement personnel of a prison so there wasn’t a big requirement from elaborate costuming. Still, they were in authentic-looking outfits, and appeared as close to the genuine article as one could ask. The best make-up easily belonged to the eyeless girl who warned/berated us for being cursed and cast us away. The monster in the underground pools area had an impressive costume, but the Stygian creature had the best outfit of the night. When searching for parking at the Dungeon, keep in mind : look for the unbelievably large Mound. It’s difficult to imagine that someone could miss the enormous, foreboding prison, but if so, there are signs available indicating that it does, indeed, house the attraction in question. There weren’t any parking spotters, but there is ample parking all around the building, and in many open lots. The starting point for the attraction does take place in a different location within the prison this year, though, so either following the flow of foot traffic, or watching for the big arrow directing toward the South Yard (I believe it’s called) is recommended. For convenience, the Dungeon uses a timed ticketing system, with 15 minute increments. This is wonderful for anyone who purchases a pass ahead of time (we only needed to wait ten minutes or so before being whisked away on a busy Saturday night), but anyone walking up to the haunt ticketless is probably going to be waiting a long time for an available slot on a busy night. Therefore, anyone reading this, PLEASE use the handy online ticketing system to order in advance. There were plenty of portable toilets available, some delicious food, and a fire-performer entertaining guests waiting in the Yard for their timeslot to approach. Also, for an additional fee, you can blast actors with paintballs while you wait. It’s a re-themed version of last season’s zombie paintball, and is actually pretty fun. After being introduced to some of the rules by an entertaining ticket taker, a short bus ride shuttles patrons to the true beginning of the attraction. The interior was quite cramped but, as we soon learned, this was a thematically-accurate toe-dip into the experience to come. All of the staff that we encountered were wonderful; I’ll spare you an exhaustive list, but helpful and friendly, they certainly were. It’s hard to manage a more appropriate setting for the type of attraction that Dungeon of Horrors is than an actual prison. The atmosphere had been good for previous seasons, but this year, a few tweaks and additions has bolstered the pre-haunt build-up immensely. It began subtly – a gruff introduction by the ticket taker after a brief waiting period in the prison yard transitioned into a strained bus ride with a driver shouting the rules of the attraction to us. Still, he inserted a dose of levity into his dialogue, so we knew that we were still in a simulation. When the bus stopped, though, we were hurried out of the vehicle by a no-nonsense prison guard, forced to place our hands on our heads, and lined up single-file. The jokes were gone; the aftertaste of “this is just for fun” dissipated, and things got serious. This gradual intensifying kept the transition from civilian to prisoner from being too jarring, but also made it more effective. The momentum established from this initial progression carried over throughout the entire first section of the attraction, building from apprehension to dread to actual fear. Given the theme and storyline of the attraction, I can’t think of a more befitting opening or atmosphere. The newly added effects to the prison portion of the attraction are fantastic and completely tie the experience together in a terrifying way. That’s all you’re getting out of me on that count. The experience is best experienced without any fore-knowledge. The transition to the second portion of the attraction involves two different “rides.” The first one returns from previous seasons, and remains just as effective; however, the new addition, which acts as the vehicle by which you “descend” into the fiery abyss was even better. It’s about as simple and old-school as you can get, but it was actually really well made. Visiting Hell has never been so much fun. As we were being “greeted” by the underlings of the Dark One, an eerie bell rang out in the background. This was the first of several well-executed aural cues that we encountered. A later segment that involved us quietly treading behind a female guide featured a really chilling soundtrack of howling wind swirling about us that made the impetus of that journey feel much more distressing. Overall, sound was used very effectively, whether as an effect, or a musical backdrop. Set design was improved this year. They kept a few of the great pieces from last season, most notably a stony underground passage surrounded by still pools and a cemetery scene, now complete with foul odors and additional animatronic menaces. However, unlike last season, there were very few lit segments that didn’t feature substantial set detail The “filth room” (for lack of a better descriptor) really stood out, mounds of some disgusting by-product reaching toward the ceiling. Most impressive this year, though, were the creative effects and props. Of the less-grandiose variety, a “ground bursting” effect from one of the plots in the cemetery appeared quite genuine, the decapitation of a poor soul was very cleverly staged, the “chaos hallway” felt like it was going to explode to cinders all around us, and the Queen’s throne, intricately crafted from (presumably) human bones. The gargantuan animatronic of the devil was truly imposing – a definite spectacle, though we wished we could understand what he was saying to us a little better. I’m fairly confident he condemned us to eternal torment – I will just never know WHICH eternal torment, sadly. Let me now speak directly to the 10% or so of you who will understand the following nerdy reference : do you remember the giant “Wheel of Pain” (yes, that’s what it’s actually called apparently) that the young titular hero was forced to tirelessly push in circles in “Conan the Barbarian?” (the Arnold version)? Yes! That one. Dungeon of Horrors has one (not quite as large, granted), and, yes, like the monosyllabic Cimmerian or legend, you are forced to man it at the bidding of a cruel master. I have no idea if this was the allusion that the Dungeon’s designers were going for, but it was really impressive either way. This time, though, instead of milling grain, it’s re-purposed to open a hidden door. Can we be candid for a moment here, just us friends? Great; thanks. 99% of “dark mazes” in haunted attractions aren’t mazes. That’s the objective truth of the matter. A linear walking path with PERHAPS an occasional dead-end inserted is NOT a maze. Conversely, guess who has an actual dark maze. You got it, and it’s a clever one. It took us a while to properly navigate the dark Catacombs, but when we emerged, there was definitely a legitimate sense of accomplishment. It’s not enormous, but can easily take weary travelers 5 minutes to negotiate. We were promised 1000 years adrift, though, so we were way ahead of the curve. The BEST effect of the night, though, had a more aquatic theme. If we’re being honest with ourselves, a LOT of attractions have added a similar effect this season : the swamp, and for good reason, because it’s really cool. However, the Dungeon has created their own version of this oft-seen effect that has blown all of the others that we’ve seen out of the… wait for it… water. This River Styx needs to be seen to be appreciated. After paying the ferryman, we boarded our boat to cross out of the Underworld, and sailed to the opposite dock while avoiding the advances of a slippery swamp monster. The river is cavern-sized, well-made, and believable. With a wee bit of suspension of disbelief, this was our favorite portion of the attraction, and one of our favorite effects of the season. Also, we were quite thankful to be released from Hades, never-ending suffering and all that. Again, I would prefer not to give away any specifics from the imprisonment portion of the attraction, but let me point out that this year’s additions really tied the entire experience together – a faithful recreation of a death row inmate’s journey, with few punches spared, condensed into ten or fifteen minutes of real apprehension and uncertainty. That alone would have been a worthwhile storyline for a haunted attraction, but the addition of the fantastical aftermath (with Dante’s Inferno as the chief inspiration) made this adventure truly epic. The story’s progression was logical (within the construct of the source material), fluid, and very effective, retaining its narrative structure without falter. There were no clowns with chainsaws astride tombstones or crazed 3-D hillbillies. Most of the residents of hell that we met were either torturing or being tortured in a variety of gruesome fashions. It’s certainly not an experience for the overly faint-hearted, but will doubtlessly be a memorable journey for anyone brave enough to sample a taste of the criminal justice system and what could, potentially, come after. We’ve never experienced anything quite like this year’s “Dungeon”, but greatly appreciated the creativity and unique theme. There are a lot of people (most of our team included), who will boast or lament that “Haunted houses just don’t scare me.” It’s true, personally, my love of haunted attractions definitely doesn’t derive from any interest in actually getting “scared.” I, like others, can be startled, certainly; unexpectedly bang a barrel three feet in front of my face in the dark and, yes, I will recoil. That’s not fear, though, it’s reflex. A lot of people who both enjoy and dislike haunted attractions are similarly constructed. Dungeon of Horrors scared me. The sensation does not derive from one particular moment of terror – there wasn’t a singular actor who jumped from a cubby hole and just happened to be the one guy who said the right thing to elicit fright. No, Dungeon of Horrors is a slow-burn, a methodical grind that employs the medium of gradualism to steadily increase its visage from mild to macabre, succeeding largely, I believe, because of the mundane and realistic version of horror that it casts upon its willing participants. Dungeon, at least in the first segment, is a different kind of attraction, and pinpointing one particularly stand-out moment of fright is impossible, with one exception – despite what I said above, there’s no ignoring the effectiveness of the prison segment’s climax. Again, to appreciate it fully, customers shouldn’t know what’s waiting for them until it happens, so I shall remain mum. Still, had it existed on its own, without the proper coddling of the embers of foreboding dread that lead up to it, it would not have been as effective. It’s ironic, then, perhaps, that the descent to Hell thereafter kind of felt like a reward for enduring the first section of the attraction. There were plenty of creepy (well-acted) characters, environment-based scares, startles, and the like in Hades, but they were more in line with what one normally anticipates from a haunted attraction. That’s not to take anything away from them, but, realistically, I’m not sure how any animatronic could possibly convey the same degree of terror as, well, those parts I won’t give away. There’s nothing like the (almost) real thing. As a set design and effect-lover, I definitely enjoyed all of the wonderful artistry on display, but in terms of pure Fright Effect, The Lord of Darkness felt like a fear-chaser. The cost of a visit to Dungeon of Horrors ranges between $20 and $28 (the traditionally less-busy the day, the less the ticket costs), and our journey to Hell and beyond lasted 50 minutes. That puts the minutes of entertainment per dollar spent between 2.5 and 1.79. If you’re reading this on a day that the Dungeon is open (go ahead and check, I’ll wait), you have my permission to stop reading this review, close your browser, and go. No, I mean that; stop reading, and go. 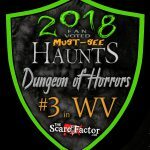 We first reviewed The Dungeon of Horrors last season and it was a lot of fun, but this season turned out to be better in nearly every way (we did miss getting to go through with the news crew we joined last season – miss you guys!) – better sets, better storyline, EXCELLENT effects and set pieces, and, of course, much scarier. 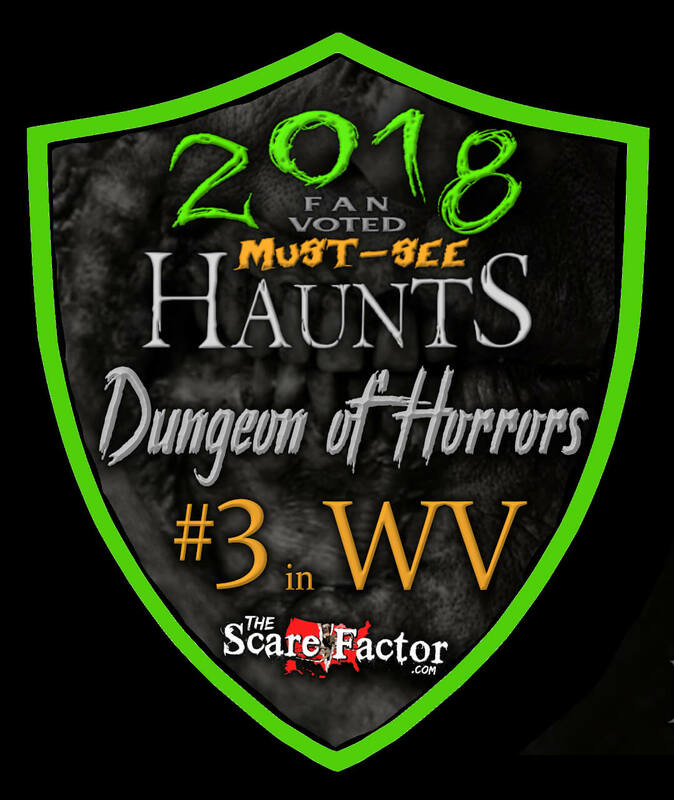 Moundsville’s Dungeon of Horrors gets our highest recommendation this season, and a tip of our digital cap for a job very well done.